Understanding who your enemy is can be the first step towards defeating him. "Aliens, Heretics, and Daemons scheme from the shadows to oppose the Imperium of Man, but the Space Marines of the Deathwatch are sworn to hunt down and destroy all enemies of the Emperor. Remain vigilant! Learn the nature of your foes, that you might better purge them from the stars. 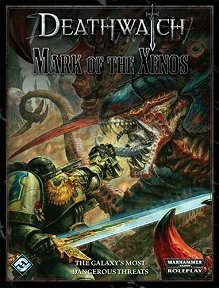 "Mark of the Xenos, a supplement for Deathwatch, presents a myriad of worthy challenges for any Space Marine, from the ravening Tyranid swarm to the sleek, technologically-advanced Tau... and many more! Discover guidance and counsel from notable members of the Deathwatch on how best to exterminate each threat. Plus, experience new advanced rules for battling hordes of creatures in massive engagements. With bolt, shell, and flame, purge the vile alien from the stars of the Jericho Reach!"